The Community Education Program was developed in 2014 to offer education and training to various external partners. These workshops provide a framework to develop larger discussions and educational opportunities surrounding today’s college campuses. 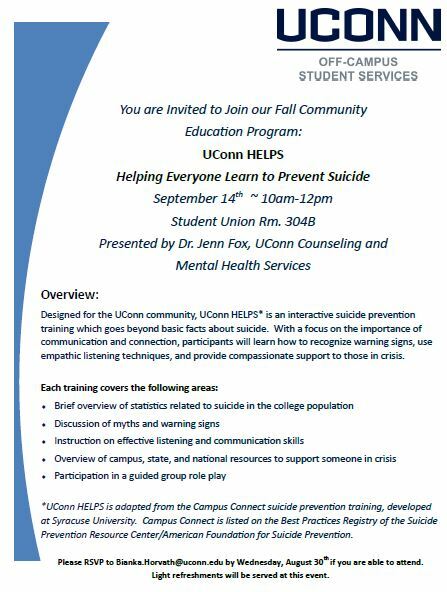 This workshop is designed to review trends emerging in college student mental health, and consider the impact these may have on both academic and student life. Discussion focuses on challenges and effective response at the individual, community and systemic level. • Why do we have fair housing laws? The active threat training is a 2 hour course that provides an overview of the resources that the UConn Police Department has to offer including a short video on active shooters on college campuses. This presentation includes what to do in the event of an active shooter scenario. This training highlights the Get Out, Hide Out to Take Out method with scenarios about each individual’s personal work place. 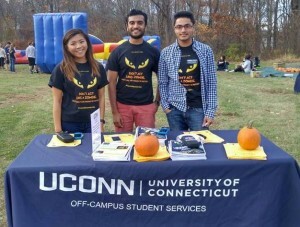 Fall Festival for all off-campus students. This event allows University Officials and Town Officials to engage with students and talk with them about responsible party hosting and most of all, Halloween Weekend safety. 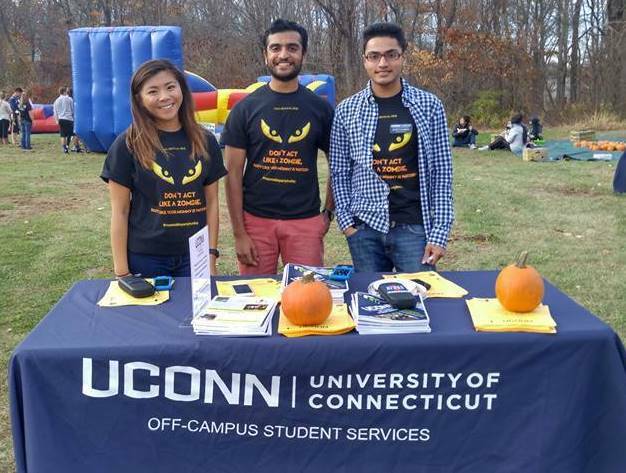 This was done so in a fun, welcoming environment with food trucks, t-shirts, pumpkin painting, and tables from various UConn Departments. This event took place at Carriage House Front Lawn since it is a visually inviting location for off-campus residents. The program model uses the QPR (Question, Persuade and Refer) curriculum, nationally recognized by the Joint Commission on Accreditation of Health Care Organizations as a “Best Practices” program. The Husky D.O.G. 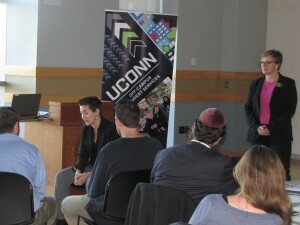 (Diversity of Gender) Training will be facilitated by the Director of the UConn Rainbow Center, Fleurette King. This workshop is strongly encouraged to help provide an educational platform & dialogue around inclusivity surrounding today’s college students. Offer specific strategies, tools, and model practices for creating safer environments for UConn’s diverse community of gender identities and expressions. Engage participants to allow for a thoughtful and productive learning experience that will contribute to a positive campus climate for those who may identify as trans*, gender non-conforming, agender, and many others along the gender spectrum. 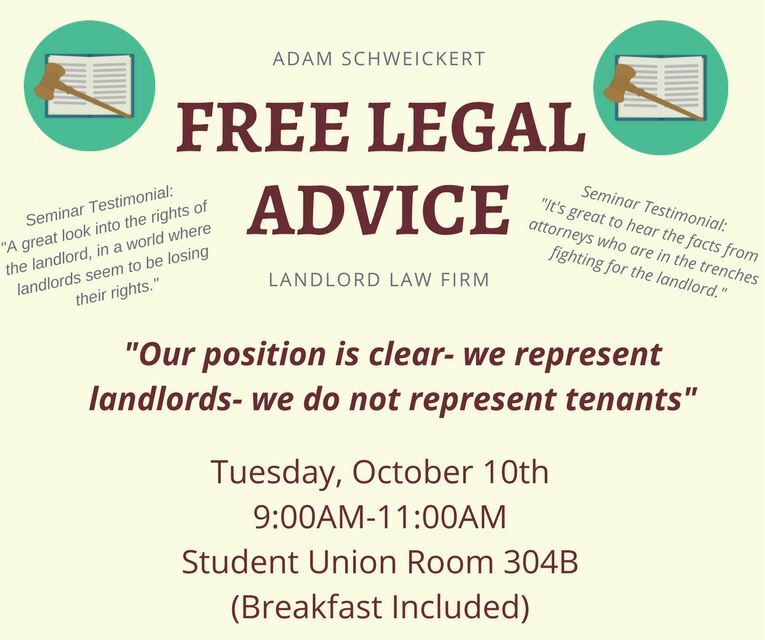 Share information, experiences, and positive ways of communicating, policies, procedures, and resources.